Energy suspension master kit groupie! - Miata Turbo Forum - Boost cars, acquire cats. Energy suspension master kit groupie! We are hoping to get 6 people! So tell your friends, boss, Grandma, and let the savings begin! Group Buy Price- $220 shipped!!! For the most popular car and truck models, both import and domestic. With just one part number you can replace all of the major suspension bushing components with HYPER-FLEX TM performance polyurethane. By installing a complete set of ENERGY's performance polyurethane bushings you'll realize an incredible improvement in control no matter what demand you put on your vehicle. Check the individual Master Set listings to determine which components are included in the set for your vehicle. 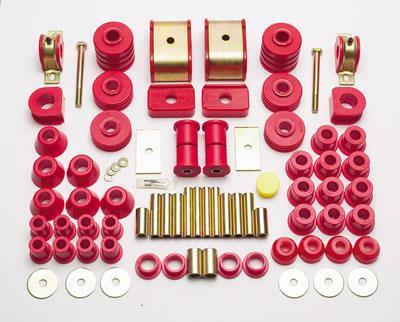 This polyurethane bushing kit includes front control arm bushings, front & rear greaseable sway bar bushings and rack & pinion bushings. This is a inexpensive, surefire way to tighen up your suspension. Last edited by Renown Performance; 11-02-2011 at 09:31 PM. Can you list which parts are included in the master kit? And is the black the graphite impregnated set, and what is the benefit of that? Last edited by wittyworks; 11-02-2011 at 09:18 PM. is the black the granite impregnated set, and what is the benefit of that? because the benefit would be excessive wear and rock-like handling. Straight from Energy suspension "Energy has impregnated selected black polyurethane components with graphite to add a lubrication property." Just about everything you would need! Lol at my granite vs graphite mistake. I'll take a set, sign me up! When will this GB end? I might be in if it is more still open in a month. At the end of the month, or when we reach 6 people. Jump in before its to late! So will the group buy only go through if 6 people buy? If it doesn't happen within a week i am going to buy the kit without the group buy from wither you or 949 racing. I need it by november 15th to install over thanksgiving break. Nope, the group buy has room for 6 people. After that no we will still have our low price just not as low. Last edited by Renown Performance; 11-03-2011 at 05:44 AM. One spot filled up and shipping out asap! lets get these kits out the door. Wont stay this low priced forever! I might be in for this. This is a pretty awesome price and my car is a 90 so I'm sure the old rubber isn't happy. Sounds great! We are shipping these same day at this point guys, let us know! Get in on a great deal guys, few more weeks to fill this order up! BUMP, moved a couple sets out so far! This week is just beginning, lets get some more of these kits out at crazy prices! Still a couple spots left here guys! Quick Reply: Energy suspension master kit groupie!